37 million girls around the world are desperate to learn. Please help today by providing basic school supplies. Education is every child’s right, yet 37 million girls around the world are missing out on primary school. The chance to learn is particularly vital for girls who have spent their young lives caught in horrific crises, living through natural disasters or caught in poverty. School is a safe place where girls can learn, play, heal psychological wounds, access medical help and regain hope for a better future. For boys and girls currently returning to school in Australia for 2019, school means a chance to learn, to make friends and prepare for their future. Nyayang, aged 10, has a different story to tell. Every day she walks to an empty classroom in South Sudan with no chairs, no tables and nothing to write on. Above all else, she is determined to learn. Nyayang, age ten, carries a broken UNICEF water container to school in South Sudan for something she can sit on. “My bucket is okay but not really comfortable. In South Sudan, UNICEF launched its Education in Emergency program. Located near camps for the displaced, UNICEF-supported schools provide safe spaces and educational opportunities for children in crisis. But enough equipment and supplies aren’t always available. From refugee camps and warzones to countries torn apart by natural disasters, girls are going to extraordinary lengths to learn despite the danger they risk. These girls don’t want to give up but they urgently need our help. Something as vital as an emergency tent or as simple as an exercise book can help get girls back to school and learning. UNICEF is working to get every girl into school and learning. There are more girls who aren’t so lucky. 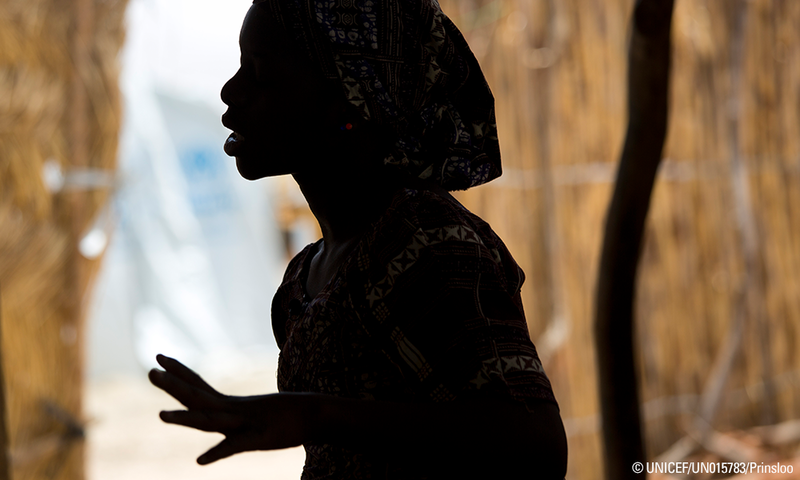 Last week 110 girls were kidnapped by Boko Haram militants after a cruel attack on their school. This follows the Chibok attack four years ago that saw 270 girls abducted, with more than 100 still missing today. In response to this horrific attack UNICEF is striving to ensure schools are safe, to provide child-friendly spaces with quality materials so kids can learn to read, write and play freely. School is a place where girls and boys can learn, play, make friends, heal psychological wounds, access medical help and regain hope for a better future. Girls in Nigeria and around the world need basic education that could change their lives. Providing basic yet vital supplies like exercise books. Supplying a ‘school-in-a-box’ with enough exercise books, pencils, erasers and scissors for a class of 40 children - plus a wind-up solar radio and blackboard. Contributing towards emergency tents to ensure girls living in crisis zones always have a safe place to learn. Your donation will also help fund essential healthcare, nutrition, clean water and child protection to children who need us most. No other children’s rights organisation has the reach or the credibility that UNICEF does with governments, communities and partners. Together, we can help reach as many children as possible. You can give children like Nyayang and Fati the chance every girl deserves for the best start in life. - Samah, 9, who is returning to school in Syria in a makeshift classroom underground. We are helping countries to build stronger education systems that remove discrimination from learning materials and teaching teachers about the importance of gender equality. The needs for girls are immense. We need to do much more and time is running out. Please donate today.